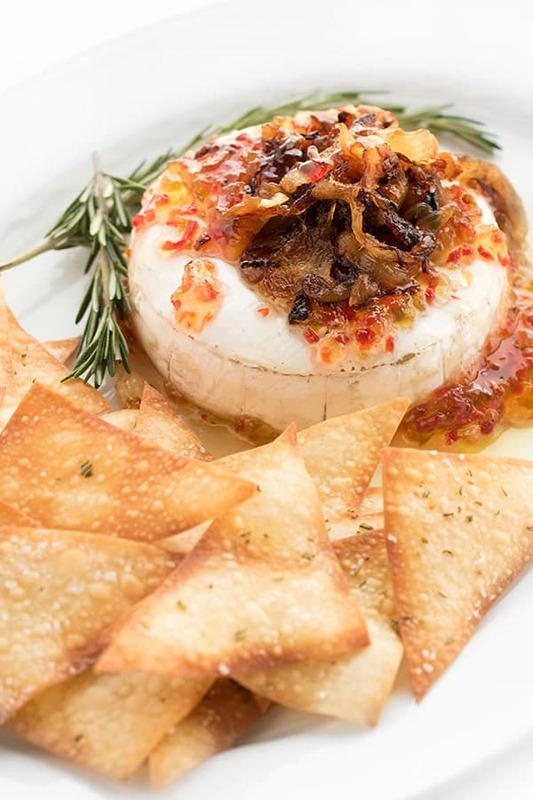 An easy appetizer recipe for entertaining, brie is topped with caramelized onions and pepper jelly before baked until warm and creamy. Serve with rosemary wonton crisps or crackers of choice. Something that might surprise you is that I don’t meal plan or print out recipes as regularly as you might think. The truth is, I really love finding ways to be creative in the kitchen using whatever ingredients I have on hand or are in season in the moment. When my friends at Milk Means More proposed a “Meal Kit Challenge” recently, I was immediately on board! 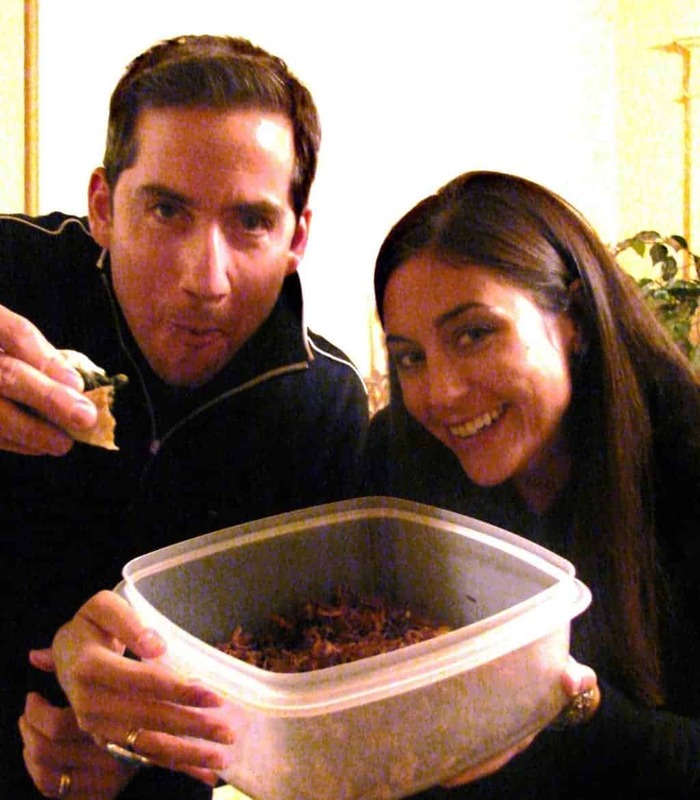 A huge fan of the Food Network and the show Chopped, I was eager and excited for the challenge. My kit included five ingredients that I was required to use in my recipe including an onion, rosemary, pepper jelly, brie cheese and wonton wrappers. Game on! While the crackers were baking, I slowly caramelized the onion until it turned golden brown and slightly sweet. I knew the sweetness of the onions would pair well with the creamy brie cheese and mildly spicy pepper jelly. The end result? A crowd-pleasing appetizer that I literally couldn’t stop eating. Great for entertaining, date night at home or hosting a girl’s night, I can’t recommend this baked brie appetizer recipe enough! An easy appetizer recipe for entertaining, brie is topped with caramelized onions and pepper jelly before baked until warm and creamy. Heat half of the olive oil (2 tablespoons) over medium high heat in a deep skillet and add onion slices. Sprinkle with salt and pepper to taste and saute until golden brown and caramelized, about 15 minutes, stirring frequently. Pre-heat oven to 350 degrees and line a baking sheet with foil. 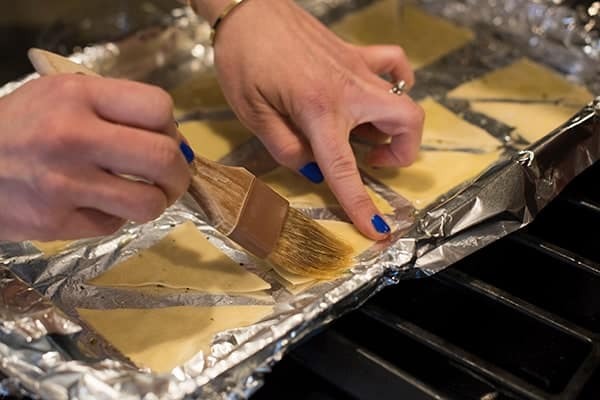 Using a pastry brush, gently brush both sides of the wonton wrappers with olive oil and sprinkle with rosemary and salt and pepper to taste. Bake until golden brown and crispy, about 7-9 minutes. Place brie in the center of a baking dish and top with caramelized onions and pepper jelly. Bake in 350 degree onion until warm and starting to melt, about 15-20 minutes. Serve with wonton crisps. Serving size is 1 ounce brie and 4 crisps. 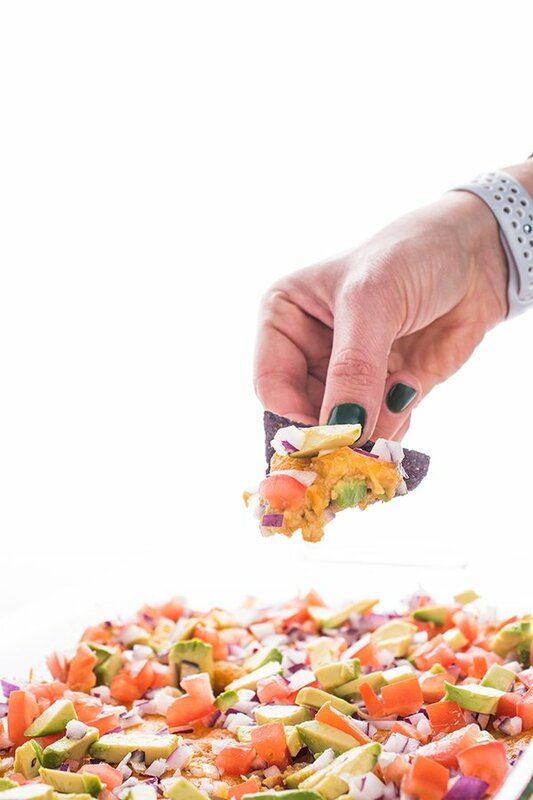 Check out my Pinterest board for more healthy appetizer recipes! Please suggest a wine pairing. Usually I have Chardonnay, but the sweet onions and pepper jelly change the flavor profile. I welcome suggestions. I would suggest Sauvignon Blanc! Can you suggest a wine pairing? I usually put Chardonnay with ,Brie. But the onions and pepper jelly adds strong flavors. Yum! I’m totally going to make this for a girl’s weekend coming up. Luckily other than the brie, I already have all the ingredients! Did you leave the rind on the Brie? That sounds like so much fun – sort of a mini “Chopped”. Love this recipe! Yes exactly!! It really was so fun! This is creative! Great pictures too. Thank you so much Meg!! I love this. I could honestly eat this for dinner. Forget meat or sides, just give me this. All my favourite things in one dish. Plus it’s just gorgeous. That is literally what I did – I couldn’t stop eating it!! Thank you!! Aww thank you so much friend! Forget entertaining! I want this for DINNER! I couldn’t stop eating it!! Just when I thought baked brie couldn’t get any more delicious… you add pepper jelly. YUMMMM. Honestly!! It was so good! Baked Brie is one of my favorite things in the entire world! I’ve never tried it with caramelized onions though – need to do that!